Price: US$ 65 ( Can Pay by : IDR ) / person per trip. Note: We have a restriction on US Dollar bills. We only accept the new dollar series and also not a small fractional dollar. Duration starts from when we pick up from your hotel till we drop your back to your hotel. More than 8 hours a day additional charge is 10% from daily rate / hour. One surf session – 2 hours maximum with guide on the water. You are more then welcome to surf longer by yourself. If you are intermediate or well-experienced surfer and want to try new breaks we will guide you to the surf spot suitable for your level and according to your wishes. The surf guide pick you up from your hotel, drive to the surf spot, explain about currents, reefs and other characteristics of the spot, surf with you and help to be in the right place in line up and we always open to sharing our surf knowledge to anyone. After surfing you will be dropped back to your hotel again. We will search for best waves and weather fit to your level on the day. What to Bring: swimsuit, wet suits, change clothes, towel, sun block, shoe reef, wax, money. Free for one non surfer for 2 days booking or more. If partners would like to tag along. Extra Charge for more then one person non surfer is: US$ 5 / person per trip. Price Excluded: any entrance fees, guest’s own expenses, surf equipment, guest’s surfing insurance. Price: US$ 60 ( Can Pay by : IDR ) / person / lesson. One surf instructor per client for maximum safety. Duration: 2 hours maximum on the water. No refund will be offered if the clients by themselves want to stop surfing before 2 hours. Surf equipment for beginner is provided for you (special surfboard request there is an extra charge). Your surf instructor will pay attention only to you. So your surf lessons will be specifically designed to meet your needs depending on your experience and wishes. On the beach you will get information about characteristics of the spot and theory of surfing. In the water our surf coach will help you to catch the waves, find the priority position and improve your surf skills. What to Bring: change clothes, towel, sun block. Free one non surfer for 2 days booking or more. If partners would like to tag along. Extra Charge for more then one person non surfer is: US$ 5 / person per trip. Price Included: Pick up and transfer to your hotel, wet suit, mineral water. Price: US$ 45 ( Can Pay by : IDR ) / person / lesson subject to minimum 2 persons. One surf instructor for 2 clients. Duration: 8 hours maximum a day, with English speaker driver. Price: US$ 60 ( Can Pay by : IDR ) / car capacity 1-5 persons. Additional Hour: 10% from daily rate / hour. Itineraries are flexible as requested or by my recommendation and fun is guaranteed. All of these prices are only provided for the hotel area includes Kuta, Legian, Seminyak, Canggu and Tanah Lot. For the single surfer if they are stays outside of these areas, the additional transportation fee will be charged US$ 10 as follows: Sanur, Nusa Dua and Jimbaran. For Uluwatu, Balian, Candidasa area and Ubud please contact us. Airport Pick-Up and Transfers: Upon Request. Once we have confirmed your dates, we require a deposit or full payment to secure you’re booking. The final payment must be done after the first surf trip / lesson. 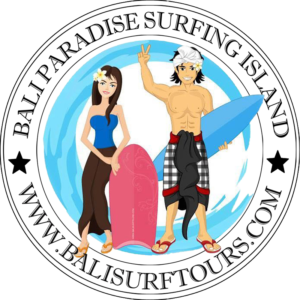 On payment of this deposit you will be deemed to have accepted these terms with BALI SURF TOURS. There are no refunds on deposits or balance of payment if the booking is cancelled. All prices exclude surfing insurance. If this is required please check with your insurance company. Cancellations on the day will charge 100% from total price for the day. Cancellation one day before will charge 50% from total price for the day. Board rental is provided if you do not have your own surf board. In the event that the rental board is broken by the surfer, an accident charge will be applied USD 250/Board. Any cut, ding and lost fin and etc required cost according to circumstances. These Terms and Conditions are covered in all their aspects by the Laws of Indonesia and any legal action that may arise related to the contract will need to be resolved before the country’s competent body. For more details please feel free to contact us by email and we will get back to you as soon as possible.